Are you looking for a drug rehab in Huntington Beach CA? Between 2005 and 2015, opioid-related visits to emergency rooms more than doubled from 20 visits per 100,000 people annually to 50 visits per 100,000 people annually. Between 2011 and 2015, more than 1,500 residents of Orange County died of an opioid overdose. The year 2018 has had an alarming rate of overdoses as well, as more and more young adults suffer from substance abuse. Fentanyl is the most popular opioid when it comes to fatal drug overdoses. It is synthetic heroin that can easily get smuggled into a city via laundry detergent bottles, potato chip bags, etc. Fentanyl is cheap and can easily be found on the street or online. It’s extremely potent and very dangerous, especially when mixed with other drugs. Hydrocodone, oxycodone, morphine, methadone, hydromorphone, heroin, methamphetamine and cocaine are other popular drugs found within Orange County. The increase in opioid abuse has to do with the increase of depression and anxiety among society. According to the ADAA, nearly 40 million people in the United States experience anxiety disorder annually and only about 1/3 of those who experience this disorder are able to find treatment for it. For children, anxiety disorders affect 25.1 percent between the ages of 13 and 18 years old. Not treating anxiety disorders shows an increase in poor school or job performance, non-interest in having a social life and engaging in drug or alcohol use. There has been a lot of speculation lately about the introduction of social media and how much affect it has on a person from a mental and emotional aspect. Anything that affects a person’s psyche in a negative way can lead to anxiety and depression. In some cases, people who are experiencing depression and anxiety look to therapists or psychiatrists for treatment which most often leads to a bottle of pills and eventually substance abuse. Therapy groups and detox facilities offer the most beneficial support when it comes to depression and anxiety. Filling a prescription for a feel-good drug will typically end in addiction which just causes more problems than before. Teen drug abuse has increased due to the fact that drugs as whole are more accessible than they used to be. Drugs can be easily found online or dealers can be easily reached through texting. Legalization of marijuana in many states means that it is more accessible for teens to find in their homes. Vape pens also make it easier for teens to use the drug more discreetly at home or at school. Opioids are increasingly dangerous for teens because most of the time they come in prescription form which has been prescribed for pain. Most teenagers believe that since this medication was prescribed to them then it is safe to take. Unfortunately, this is leading to more addictions or more fatal overdoses. Teen alcohol is on the rise as well and many teens have found very secretive ways to get a high such as soaking their tampons or pouring liquor into to their eyes to get alcohol straight into their blood stream. Drugs affect teens differently than adults because a teenager’s brain is still developing. It will continue to develop until they are in their mid-20’s. The use of drugs can slow down the brain’s development and also can disrupt the chemicals in the brain. This can lead to some mental health problems like anxiety and/or depression. It’s important to spread awareness about drug use because a lot of teenagers are not aware of the fact that prescription medications can be just as dangerous as other street drugs. Just like so many other county’s across the United States, Orange County is suing Purdue Pharma, which is the maker of OxyContin as well as Janssen Pharmaceuticals, and Teva Pharmaceutical Industries for making billions of dollars by marking painkillers to help patients and downplaying the addictive nature of the painkillers. Many Orange County drug rehabs have also had issues receiving payment from insurance carriers who are refusing to pay for some patients drug rehabilitation. Orange County also has a National Council of Alcoholism and Drug Dependence (NCADD) group that creates and implements prevention tactics to help decrease underage drinking. PATH, Positive Actions Toward Health is a community program that helps to create healthy and safe communities by reducing alcohol and drug use. Education, technical assistance and training is provided to all cities of Orange County. To prevent the prescription misuse and over-the-counter (OTC) drug abuse, RX for Prevention was founded. This community-based service helps to spread awareness about what teens and adults deem as safe drugs because they are either prescribed or can be bought OTC. To help with fatal drug overdoses in Huntington Beach, lifeguards and some beach managers have been trained in administer Narcan, a life-saving overdose drug that reverses the effects of an opioid overdose. The first part of the drug rehab process starts with an assessment. An assessment is a series of questions that helps the facilities staff to understand a patient better. 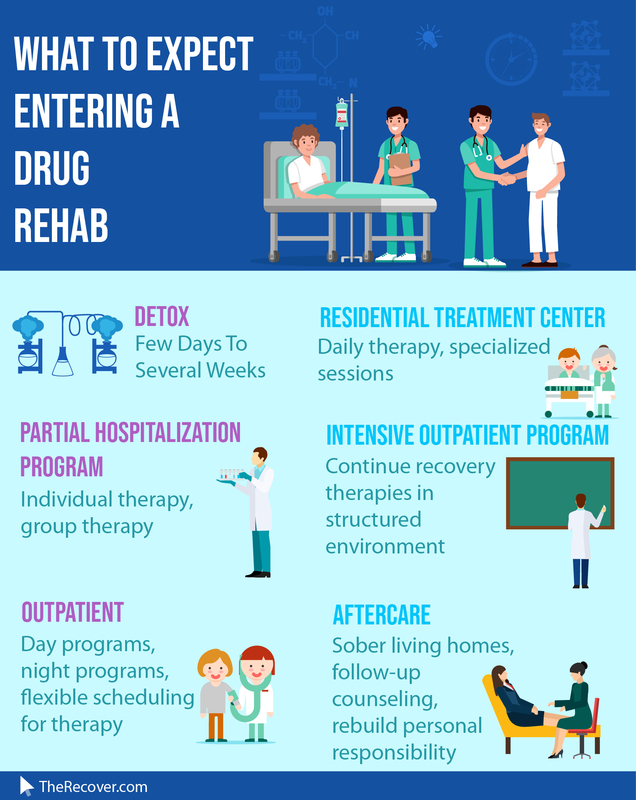 Many times a drug rehab center can help any patient that walks through their front door. In the circumstances that the facility cannot help, the center will usually direct a patient to one that can. What type of drug is one using? What is the history of drug use? Are multiple drugs being used? Is alcohol being used with the drugs? Are there any preexisting mental conditions? The assessment allows for the facility to recommend either inpatient or outpatient treatment for a patient. Honesty is important when answering the assessment as it helps to provide a more accurate treatment for a patient. The intake includes a questionnaire that dives deeper than the assessment. The questionnaire asks about family medical, mental and drug history as well as the social environment of a patient. Again, it’s important to answer the questions as honestly as possible. During the intake part of the drug rehabilitation process, a patient is admitted into the facility. During which, the patient will go through a baggage check to make sure they do not have any items that are no permitted into the facility. Financial arrangements will be made at this time too. A physical exam and a urine test will be administered to check for drug usage and possible underlying symptoms. The doctor will also check to make sure that the body can withstand withdrawal symptoms. The third part of the drug rehab process is difficult for a lot of people and a big reason why many people turn away from treatment. Detox cleanses the body of all drugs and usually lasts 4-7 days. This really depends on what type of drug is being used and how long drugs have been used. If a patient who is admitted into a facility is not using drugs at the time, detox isn’t necessary. To locate a drug detox in Huntington Beach use the addiction helpline and ask for local references. Withdrawal symptoms create a struggle from patient’s in treatment because they can cause a lot of physical, emotional and mental anguish. In severe cases of drug withdrawal, a doctor will prescribe medications to help with the symptoms such a Methadone. Patients are not usually taken off a drug all at one (the cold-turkey method) and are usually weaned off little by little to help with any harsh symptoms that could occur. In instances where a patient is withdrawing from opioids which have the harshest symptoms, medication is given to the patient to help with withdrawal symptoms. There are two types of treatment in every drug rehab facility. The first type is called inpatient treatment. This type of treatment is for patients who need around-the-clock care and need to be admitted into a facility. Most drug rehab centers call this RTC, Residential Treatment Center. Inpatient drug rehab treatment in Huntington Beach or RTC is designed for patients who have just come out of detoxing. Detoxing is for cleansing the body while RTC cleanses the mind. RTC deals in many types of therapies but one of the most beneficial types of therapies is called Cognitive Behavioral Therapy (CBT). This type of therapy is for patients who have a lot of distorted thoughts. Distorted thinking happens during depression or moments of anxiety. The more a person is depressed or suffers from anxiety, the more a person starts to think in a distorted pattern. A patient may believe that everyone is out to get them (emotional reasoning) or that they are failure in life (personalization) or that there is no help for them at all (all-or-nothing thinking). This is only three types of distorted thinking patterns, there are 7 more. Each of them has its own effect on a person’s mind which in turn affects a person’s relationships. Distorted thinking can also affect ones performance at work or school which can cause someone to feel like they are unworthy. These are all patterns that can lead to drug or alcohol use. CBT takes a person through their past, step by step to find out where distorted thinking originated and why a person started using drugs. CBT helps to uncover triggers that can lead to drug use or drug addiction. It is just one type of therapy. There are many other types like group, music and art therapy. RTC is a 28-day program that admits a patient into the facility. Some patients stay longer and it all depends on the doctor’s recommendation. While at the facility, there are recreational activities that patients are free to explore such as painting, meditation and yoga. All of which, patients find relaxing and calming during their recovery. Outpatient treatment in Huntington Beach comes in two different forms. The first one happens right after RTC and is called PHP, Partial Hospitalization Program. PHP is a program that takes place at a drug rehab facility for 6 hours a day, 5-7 days a week. PHP helps patients to find what coping skills are beneficial for calming triggers that lead to drug use. Since people are different, coping skills range from drawing to writing to playing music to exercising. PHP includes both individual and group therapy. IOP, Intensive Outpatient Program is the generally the last treatment option offered for a patient who has already under gone both RTC and PHP. IOP takes places at a drug rehab facility 3 days a week for 3 hours a day. It is highly focused around group therapy. In fact, it is generally considered as an introduction to support groups. Coping skills are encouraged throughout the duration of IOP as well. The length of both treatment options will be recommended by a doctor. PHP can last as little as a week or up to six weeks while IOP usually last between 12 to 16 weeks. Long term drug rehabs can last from several months, and as much as a year for those who wish to attend. Sober living houses are half-way houses in between rehab facilities and a patient living independently on their own. Residents are free to come and go as they wish and are free to outside activities such as being employed or going back to school. Patients can learn about these homes while still in the RTC program and will most often get a list of resources that are helpful for when a patient is released. There are many rules for sober living houses but the most important rule is to stay sober. If a patient drinks or does drugs while living in one of these houses, the drug rehabilitation process has to start all over again. A sober living house is a great way for someone who is recovering to regain their footing again. Within the three programs mentioned above, aftercare is heard among all of them. Aftercare is the ability to care for oneself after they have been released from all three programs. Preventing a relapse is the number one goal for recovering from drug or alcohol addiction. It’s also important to know that there is absolutely no cure for addiction. People who are in recovery will need to be recovery for the rest of their life because temptation to use drugs or to drink will always be there. Staying busy is a good way because idle hands mean idle play which can lead someone who is recovering to find themselves bored. Boredom creates the desire to give into those temptations that wish to see all of us fail. Staying busy by working, going to school or entertaining a new hobby is the perfect way to say no to temptation and boredom. Support groups are full of amazing people who are trying to do the same thing, stay sober. Therefore, they are perfect for getting the support one needs to be able to stay away from drugs or alcohol. Support groups are full of people who want success so everyone wants to help everyone else. These groups are also full of people who will sponsor others. Sponsors are generally recovering addicts who have been in the program for many years and have a great track record of staying clean. It’s important for anyone who trying to maintain their sobriety to join a support group and attend it regularly. A great way to create a relapse prevention plan is to handle trigger or warning signs. Handle negative emotions by talking to friends or a family member who is reliable. Negative emotions are ones that make us feel bad such as: stress, guilt, shame, fear, anger, depression, vulnerability, rejection, loneliness, anxiety and embarrassment. It’s important to stay away from old friends who is still using drugs and from the social pressures to use drugs. Positivity in everything a recovering addict does is the most important way to create a relapse prevention plan. Triggers need to be defined so that when they flare up, they can be managed without using drugs to satiate them. To eliminate triggers, it’s important to define them first. If a person doesn’t know what triggers them to use drugs, it is hard to know what to do when it happens. Triggers can be anything. They can be feelings or emotions from the past, present or even future. They can be self-defeating thoughts. Whatever the trigger is, it needs to be defined so that coping skills can be created to help eliminate the trigger. When the body isn’t getting the right foods that contain minerals, vitamins, fiber and protein it can start to affect neurotransmitters such as dopamine or serotonin and throw off the chemical balance in the brain. What we eat affects these neurotransmitters because the stomach acts as a second brain. Example, Ninety percent of the body’s serotonin is made in the digestive tract. Eating a healthy amount of fruits, vegetables, lean meats and whole grains provides a good way to stay healthy and keep those neurotransmitters working right. Exercise is a good physical outlet that helps not only to avoid boredom that can trigger a relapse but also keeps one busy. Yoga and meditation are elements that one usually learns about while in RTC. Drug rehabilitation centers have been implementing both into their therapy methods for years. Yoga helps to balance the mind and body while meditation helps one to de-stress through breathing exercises. Both are important to the body, mind and soul and they are both excellent ways to stay on track and avoid a relapse. Yoga comes in many fun poses like Eagle or Tree pose while meditation can be done with music, words, chimes or even in silence. Forty-sixty percent of recovering drug addicts relapse according to the NIDA, National Institute on Drug Abuse. Relapses happen and once they do, there is no going back. They can’t be swept under the rug and they can’t be ignored. It’s important to own up to the relapse and to get back on track again. It’s also important to know that many people relapse so it’s doesn’t have to feel lonely. Staying sober can be difficult because not only is there so much temptation in the world, there is also so much stress in the world. It can be overwhelming. When a person leaves rehab, they are leaving the safety and comfort of knowing that someone is there to catch them and pick them back up again so they can keep moving forward. When a person is free to fly solo, it can be extremely hard to stay on top of everyday life. Relapsing isn’t an ending. It’s the chance to start over again. Recovery is a life-long process and some days will feel easy and some days will feel hard, just keep moving forward. Huntington Beach is located 30 miles south of Los Angles, in Orange County. It’s most famous for its sandy beaches and surfer culture. Known as Surf City, it has a population of 201,874 people and a 9 ½ mile long beach. Lead singer Dryden Mitchell from the band Alien Ant Farm resides in Huntington Beach. Violet Cowden, a member of the Women Airforce Service Pilots and aviator during World War II also resided in the beach city. There are so many fun things to do in Huntington Beach such as the International Surfing Museum. The museum displays the world’s largest surfboard which is 42 feet long. Since the city is known for its amazing beach and is a hot tour spot for surfers, there’s no question that the city also has amazing sunsets. These sunsets can be seen on an old pier that’s been destroyed by three storms and an earthquake. Reinforced by steel, it’s now stronger than ever and is listed on the National Register of Historic Places. With amazing beach sunsets and surf-loving fun, Huntington Beach is a top hot-spot for summer vacations but it’s also becoming a top hot-spot for something else too, drugs. Much like other counties across America, Orange County is feeling the effects of the opioid epidemic. In 2017, Huntington Beach took the lead for hospitalizations for drug use and fatal overdoses in all of Orange County. In the county, 66.8 percent of drug-related overdoses are caused by prescription based opioids and 75 percent of those deaths are purely accidental. For information regarding California drug rehabs click on the highlighted link and find out more about treatment options. If you or a loved one is struggling with substance abuse in Orange County and want to find a drug rehab in Huntington Beach, contact our helpline now to discuss your treatment options.